Bayern (Bavaria), formally the Free State of Bayern (Freistaat Bayern, is a state of Germany, located in the southeast of Germany. With an area of 70,548 square kilometers it is the largest state by area, forming almost 20% of the total land area of Germany. Bavaria is Germany's second most populous state (after North Rhine-Westphalia), with 12.5 million inhabitants, more than any of the three sovereign states on its borders. Bavaria's capital and largest city is Munich, the third largest city in Germany. One of the oldest states of Europe, it was established as a duchy in the mid first millennium. In the 17th century, the Duke of Bavaria became a Prince-elector of the Holy Roman Empire. The Kingdom of Bavaria existed from 1806 to 1918, and Bavaria has since been a free state (republic). Modern Bavaria also includes parts of the historical regions of Franconia and Swabia. Bavarian people can be proud of more than 1000 years of cultural and intellectual history. Section 3 of the Bavarian Constitution quotes that Bavaria is a culture state. Since 2003 the Free State has spent more than 500 million Euro of its budget per year on the support of art and culture, significant donations from both Bavarian communities and private sponsors follow in addition. The Bavarian nation is composed of four officially recognized tribes: three native tribes, namely Old Bavarians ("Baiern"), Franconians, Swabians and more than two million refugees and expellees after 1945. Bavarians commonly emphasize pride in their traditions. Traditional costumes collectively known as Tracht are worn on special occasions and include in Altbayern Lederhosen for males and Dirndl for females. Centuries-old folk music is performed. The Maibaum, or Maypole, and the bagpipes in the Upper Palatine region bear witness to the ancient Celtic and Germanic remnants of cultural heritage of the region. A cultural particularity is represented by the regional spoken dialect referred to as “Boarisch”. Most Bavarians speak traditional German or “Hochdeutsch” as well but in the rural regions, the Bavarian dialect is a constant presence. Bavarian S' Boarische is a Grubbm vo Dialekt im Sidn vom daitschn Språchraum. Standard German Das Bairische ist eine Gruppe von Dialekten im Süden des deutschen Sprachraumes. Standard German Bavarian is a group of dialects in the south of the German-speaking area. Traditions and customs enjoy a high status in Bavaria. Folk songs, folk dances and folk music are practiced in many Bavarian towns and townships. Traditions are carried on by culture clubs, societies for traditional costumes, folk dance groups and bands. Some of the traditionally known home festivals such as the "Tänzelfest", a dance festival in Kaufbeuren, and the "Kinderzeche", a pageant in Dinkelsbühl, are held particularly for children. Medieval knight tournaments can be watched in Kaltenberg and Kiefersfelden. 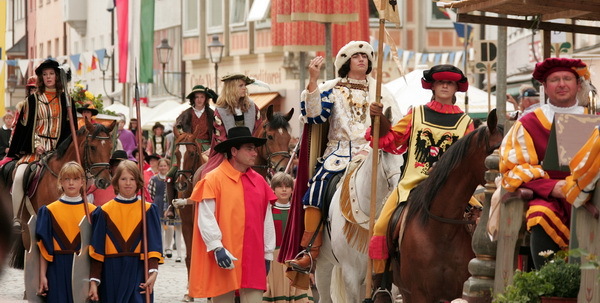 Numerous other historic pageants such as the "Landshut Wedding" (Landshuter Hochzeit) in Landshut, the "Meistertrunk" ("Master Draught") in Rothenburg ob der Tauber, the Wallenstein Festivals in Altdorf near Nuremberg and the Frundsberg Festival in Mindelheim can be enjoyed in addition. The slaying of the dragon (festival in Furth im Wald) is based on an old myth. 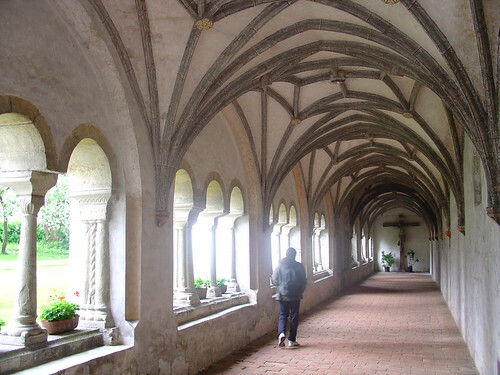 The Bavarian architecture shows historical evidence of more than 1200 years of history. 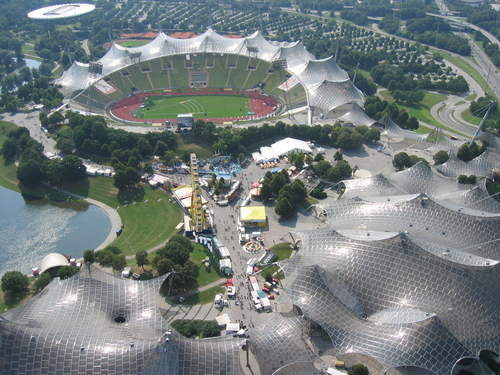 It ranges from the 8th century ring crypt of St. Emmeran near Regensburg to the impressive tent roof in the Olympic Park in Munich. Romantic and Gothic styles are represented by churches and monasteries such as Altenstadt, Ebrach and St. Lorenz in Nuremberg and cathedrals in Augsburg, Bamberg, Freising, Regensburg and Würzburg. Augsburg's Fugger Chapel St. Anna was built in the 16th century and it was the first Renaissance building errected north of the Alps. The Residence in Landshut, the Hirsvogel Hall in Nuremberg and Munich's former royal stables "Alte Münze" (literally "Old Coin") are further highlights of this era, which ceased with the completion of Augsburg's city hall by Elias Holl. Architectural achievements of the 19th century are closely associated with names like Leo von Klenze and Friedrich von Gärtner. Conducted by King Ludwig I, both of them significantly characterized Munich's image with their buildings. 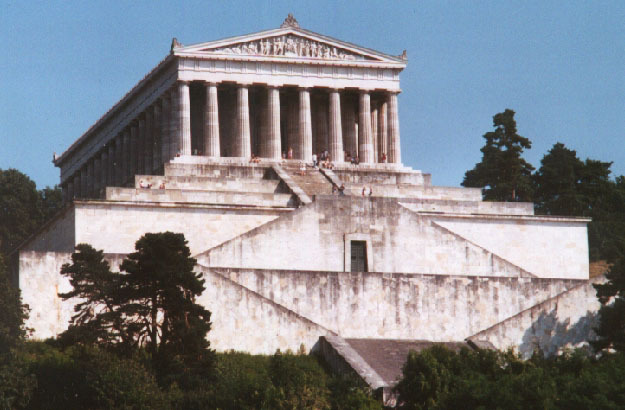 Their most famous buildings include the Walhalla near Regensburg and the Hall of Liberation in Kelheim. A number of 19th century industrial buildings in Augsburg and Nuremberg as well as some regular 20th century buildings are already now considered significant monuments. With 11000 sacral and secular buildings and 40000 archaeological sites, Bavaria is rich in monuments. Bavaria's museum landscape includes more than 1.150 institutions operated by the state, municipalities, districts and towns, but also by associations, foundations, firms and private collectors, which makes it the most diverse and alive museum landscape in Germany. More than 20 million visitors per year make Bavaria the undisputed number one nationwide. Bavaria's government makes sure to keep its museum landscape up-to-date and in motion: the present restoration of the Bavarian National Museum is one of the most notable examples of the focus on cultural policy. The erection of two new museums, the "Sammlung Brandhorst" ("Brandhorst Collection") and the State Museum of Egyptian Art are two further excellent museum projects in the making. 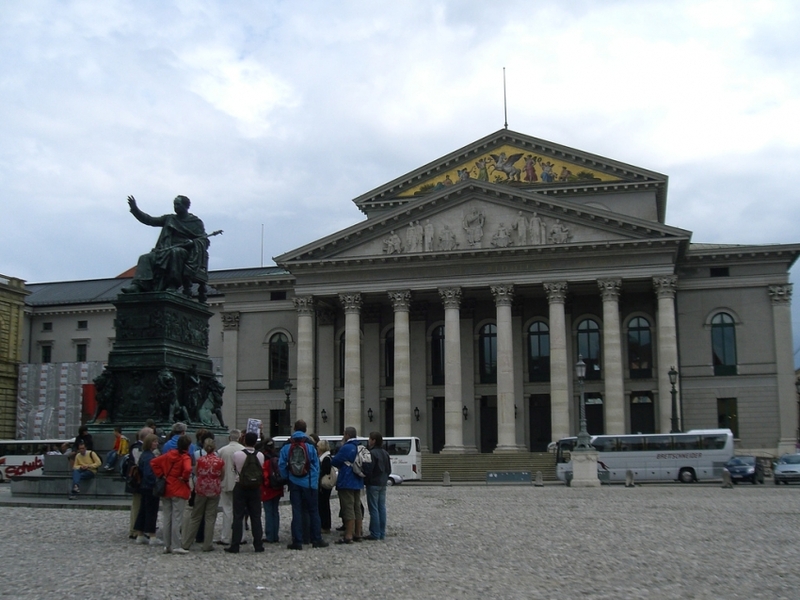 State museums and art galleries are largely located in Munich. However, the decision was made to build a state-owned textile museum in Augsburg, which makes it the third of its kind to be located outside of Munich, alongside the State Museum for Art and Design in Nuremberg and the Army Museum in Ingolstadt. State-owned collections are displayed in every district of Bavaria and can be found in one of the 40 branch museums of Bavarian mother houses. Bavarians tend to place a great value on food and drink. In addition to their renowned dishes, Bavarians also consume many items of food and drink which are unusual elsewhere in Germany, for example the Weisswurst. At folk festivals and in many beer gardens, beer is traditionally served by the litre in the so-called Maß. Bavarians are particularly proud of the traditional Reinheitsgebot, or purity law that allows beer to be made out of only 3 ingredients: water, barley and hops. Bavarians are also known as some of the world’s most beer-loving people with an average annual consumption of 170 liters per person, although figures have been declining in the recent years. Bavaria is also home to the Franconia wine region which is situated along the Main River in Franconia. The region has produced wine (Frankenwein for over 1000 years and is famous for its use of the Bocksbeutel wine bottle. The production of wine forms an integral part of the regional culture and many of its villages and cities hold their own wine festivals (Weinfeste) throughout the year. Bavaria has long had one of the largest and healthiest economies of any region in Germany, or Europe for that matter. Its GDP in 2007 exceeded 434 billion Euros. This makes Bavaria itself one of the largest economies in Europe and only 17 countries in the world have higher GDP. Some large companies headquarters in Bavaria include BMW, Siemens, Rohde & Schwarz, Audi, Munich Re, Allianz, Infineon, MAN, Wacker Chemie, Puma and Adidas. Bavaria has a GDP per capita of over 40000 Euro, meaning that if it were its own independent country it would rank 7th in the world.